Shrubs, 30-150 cm (sap fragrant). 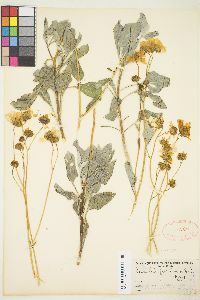 Stems branched distally, tomentose, developing smooth barks. 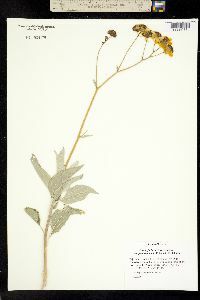 Leaves cauline (clustered near stem tips); petioles 10-20 mm; blades silver or gray, ovate to lanceolate, 20-70 mm, apices obtuse or acute, faces tomentose. Heads in paniculiform arrays (branching among heads mainly distal). 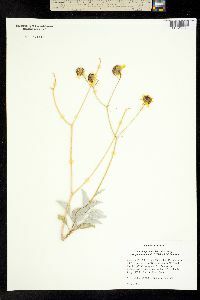 Peduncles glabrous except near heads (± yellow). Involucres 4-10 mm. 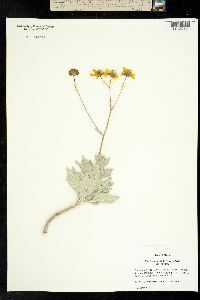 Phyllaries lanceolate. Ray florets 11-21; corolla laminae 8-12 mm. Disc corollas yellow or brown-purple, 5-6 mm. Cypselae 3-6 mm; pappi 0. 2n = 36. Flowering Feb-May, Aug-Sep. Coastal scrub, stony desert hillsides; 0-1000 m; Ariz., Calif., Nev.; Mexico (Baja California, Baja California Sur, Sinaloa, Sonora). 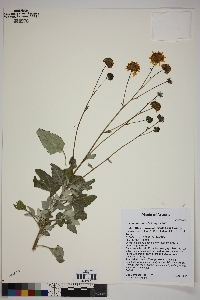 Plants of Encelia farinosa with brown-purple disc corollas, found along the Colorado and Salt rivers, and common in Baja California, are var. phenicodonta. 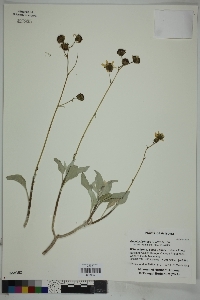 Plants with substrigose leaves, capitulescences branched toward bases rather than distally, and ray florets reduced in both size and number are most often hybrids and backcrosses between E. farinosa and E. frutescens. P. A. Munz (1959) indicated that I. L. Wiggins had reported var. 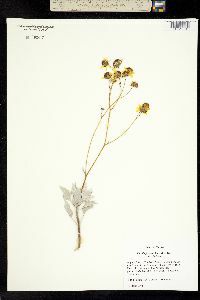 radians Brandegee ex S. F. Blake as occurring in southeastern California; that variety is known only from Baja California.